He's called a once-in-a-lifetime type of player in the Ontario Hockey League. He's received rave reviews from not only Sidney Crosby, the face of the Pittsburgh Penguins franchise, but the entire hockey world. He's projected to be the No. 1 overall pick in the 2015 National Hockey League entry draft. So, who is he? Well, folks, you don't have to travel that far to find out. He's Connor McDavid, the 15-year-old rookie sensation currently tearing up the OHL for the Erie Otters. "He's by far one of the best players I have ever seen at this level," said Bill Baker, one of many fans of the team that have flocked to the under-construction Erie Insurance Arena to see McDavid play this season. "You're not supposed to be that good at that age. But, so far, he's proven that the hype surrounding him was well worth it. "I think from what I, and others, have read about him, we knew he was going to be good, just not this good." McDavid, a New Market, Ontario product, is as good as advertised. Through 23 games this season, McDavid leads all rookies with 26 points (13 goals, 17 assists) and is second on the Otters in the same department behind team captain and Toronto Maple Leafs' prospect Connor Brown. 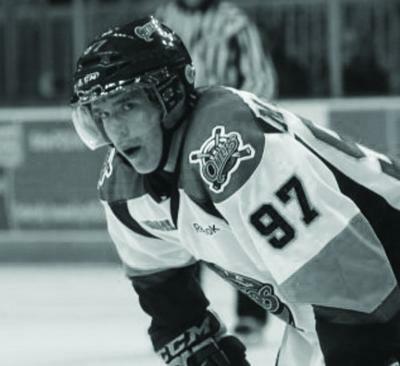 Earlier this season, McDavid, after being held pointless in his OHL debut, strung together a league-best 15-game point streak and was also the youngest player ever selected to compete in the Subway Super Series, an annual six-game exhibition tournament held between a select team of Russian junior players and all-star teams representing the three leagues – the OHL, the Western Hockey League, and the Quebec Major Junior Hockey League – of the Canadian Hockey League. Not bad for a rookie, especially when you consider the league is filled with arguably the best talent in the CHL. McDavid's strong start came with a little bit of help. Not from his teammates or coaches, but from Hockey Canada, the sport's national governing body in that country. McDavid filled out the request to join the OHL a year before other skaters in his birth year, and Hockey Canada granted him exceptional status, allowing a team to take him in the OHL Priority Selection Draft last May. One of the greatest factors Hockey Canada looks for before granting this status is if the player is good enough to play in the OHL or any other form of Junior A Hockey. In the league's 34-year history, only three other players have been granted exceptional status, the most recent being Aaron Ekblad, a defenseman for the Barrie Colts drafted in the 2011 draft. The others? Jason Spezza of the Ottawa Senators and John Tavares of the New York Islanders, two household names in NHL. As for the question of whether McDavid is good enough to play, he has emphatically answered that game in and game out so far this season. His success in his first two months may be a year's worth for any other rookie in the league. He appears to be the clear-cut favorite for the Emms Family Trophy, awarded to the top rookie in the league. In past seasons – discounting Nail Yakupov's 101-point outburst two seasons ago – rookies have averaged right around 60 points per season, a mark McDavid should soar past based on his play so far. Yakupov was the No. 1 overall pick of the Edmonton Oilers in 2012 NHL Entry Draft. But, from McDavid's standpoint, this is just the tip of the iceberg for him. "[This season] has been a really good experience, so far," McDavid said. "I wasn't sure coming into the year how it was going to play out. I've had a little bit of personal success, but I still think there is a lot more I can give." The latter may be good news for the Otters. In the early stages of the 2012-13 season, Erie has once again struggled, coming out the gates to a tune of a 7-13-1-2 (wins-losses-overtime losses-shootout losses) through its first 23 games, which is bad enough for last place in not only the Midwest Division, but the entire Western Conference. A year removed from a 10-52-3-3 mark, the worst in franchise history, The Otters may look at McDavid as the savior of the franchise or maybe even the player to bring the Otters back to relevance in the OHL..In all likelihood, McDavid will not play for the Otters after the 2014-15 season since he'll most likely will either be in the American Hockey League, or the NHL. Sounds like a lot of pressure for the kid, right? Think again. McDavid, who won't turn 16 until Jan.13, 2013, has been in the spotlight since his exceptional player status was granted on March 21, 2012. North American media outlets have flocked to him; media outlets include ESPN.com, The Toronto Sun, Yahoo! Sports, Hockey News, TSN, and Sportsnet are just a small sample of those trying to get McDavid in their papers and on their television screens. But it doesn't stop there. Even Montreal, with mostly French-speaking natives, wants in on the McDavid hype. A reporter drove more than 400 miles to Guelph, Ontario for a pregame interview that Paul Roper, Otters media relations manager and play-by-play broadcaster, set up. Dealing with such hype is not only new for Roper, but the entire franchise. "It's been pretty busy since Connor joined our team," said Roper, who enters his third season calling games for Erie. "Last year, interview requests were pretty scarce and I'd have to pitch ideas to news outlets. This year, they all want to talk to him. I probably get three or four requests a week and he's already talked to about 25 news outlets since the season has started." In just two months, McDavid has become the face of the franchise. Fans are wearing T-shirts sporting his last name and have lined up by the dozens for him to sign a poster after a home game. He is the must-see attraction whether it's a home or away game. Even though he has grown accustomed to the spotlight and the attention surrounding him, McDavid said he didn't think he would gather this much attention. "Obviously, this is really different from what I'm used to," McDavid said. "I'm starting to get used to it. But I wasn't expecting it to be this big. I've had interviews from TSN and RDS – they are just coming from all over. It's just amazing." But through the countless interviews and Tweets he receives raving about his play, his biggest compliment came from the biggest star in the game – Crosby himself, when he told reporters that after watching McDavid play that "He looks like he's got it all… When I watched him play, he reminded me of myself." "That's obviously an amazing honor," said McDavid, who is a big Pittsburgh Penguins and Crosby fan. "That's something that doesn't happen too often. For him to say something like that, it's a tremendous honor." Sid the Kid may be on to something with such high praise. In many ways, his demeanor is the same as Crosby on and off the ice. On it, he is as confident with the puck as a player with a decade of experience under his pads. Off of it, he's just a normal teenager living a not-so-normal life for a 15-year-old. Additionally, McDavid has proven he's a threat to score every time he touches the puck. He's got electric speed and showed earlier this season he's not afraid to attack some of the upper-echelon defensemen in the OHL. He proved it Oct. 6 when rival London made their first trip of the season to Erie. With Penguins' brass, such as head coach Dan Bylsma and Bill Guerin in attendance at Erie Insurance Arena to scout defensemen Olli Maatta and Scott Harrington, two Penguins' prospects and arguably the two of the top D-men in the league, McDavid gave them something else to take note of on that night. McDavid, in just his second home game, intercepted a pass in his own zone, put a filthy deke on Harrington and used his speed to get around the bruising defender. He finished off the play with a pretty backhand-forehand goal right on top of the crease for a tally that brought the crowd to its feet. However, the Otters lost that game 4-3 in a nine-round shootout. And McDavid was quick to point that out after the game to reporters. It's not that he didn't want to talk about his goal; he wanted to talk about the team, not an individual performance in a losing effort. Though he may just be 15 and in the back of his mind may know he's the next big thing, he's also the epitome of a team player. He's quick to point out that it's not all about him and that fans shouldn't just come to see him play. He wants the team to get better, make a playoff run, and to have successful seasons. "I don't have too many individual goals," McDavid said. "I don't determine personal success on numbers. I just want us to make the playoffs." His pass-first, shoot-second mentally has paid off in a big way for his linemate J.P. Labardo. Labardo, who was acquired earlier this season from the Oshawa Generals, couldn't find ice time before being dealt to Erie. He was a third-liner who barely saw more than 10 minutes a game some nights. Now, the overage winger is on pace for a career high in points and is making his case that he may just have the ability to play at the next level one day in the future. "He's making me feel young again," Labardo said. "Connor is making hockey fun again, and I'm just so happy to be on a line with him." Labardo isn't the only one happy these days around the Erie Insurance Arena. Sherry Bassin, Otters managing partner and general manager, can't praise his rising star enough. In fact, if you ask him about McDavid, he could talk for 20 minutes on his young star. "He's been a great watch," said Baker, a former season ticket holder and fan of Erie hockey since the days of the Erie Panthers and Erie Blades. "You never know when he is going to make a highlight-reel play, but you know he's going to be fun to watch every game." For Erie fans, it could be the start of something special. For McDavid, it's obvious that what he's doing and what he is capable of doing will make him a special player for years to come. Alexander P. Sibley can be contacted aSibley@ErieReader.com.